Traveling through 'Amish Country' more than 20 years ago, we fell in love with the simplicity of the Amish lifestyle and began to collect Amish furniture for our own home. Returning often, we've forged long-time friendships and now proudly represent more than 70 Amish furniture makers. Our website offers 40% discounts off of list prices every day. By browsing this site and consulting with our knowledgeable staff, you can select from thousands of styles, woods, stains, fabrics and finishes. Using sustainable reforested lumber, your furniture is custom made and delivered to your home, typically in 6-8 weeks. Enjoy. Since the Amish restrain from the use of phones and computers, we proudly serve as their representatives, offering discounts of 40% below suggested retail prices on custom furniture by more than 70 Amish manufacturers. Because our offices are in Oregon, we collect no sales tax. 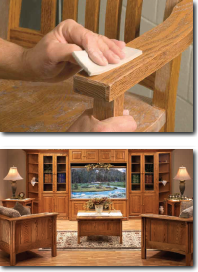 Working with Amish craftsmen for many years, we've learned that "custom built" means just that. You select the size, wood, stain, finish... and the best way to get exactly what you want is to talk with our experienced staff. Call us 7 days a week and we'll gladly answer your questions. “Amish” isn't a style, it's simply a group of people who have handcrafted furniture for generations. Yes, the Amish are famous for Shaker and Mission pieces, but they also make French Provincial, Early American, Queen Anne, Tuscan, Aspen, Victorian, Craftsman... even contemporary furniture. 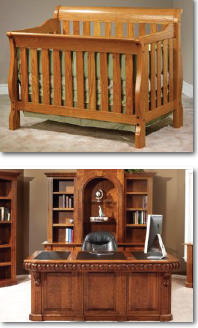 We offer solid wood furniture handcrafted by Amish families directly to your family at very affordable prices. 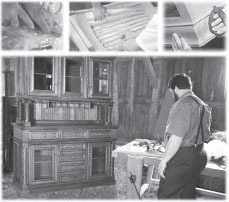 Although the term Amish furniture typically refers to mission furniture and shaker furniture, Amish craftsmen are also known for a wide variety of hand built furniture styles including country furniture, arts and crafts furniture, craftsman furniture, victorian furniture, Queen Anne furniture, early American furniture, French provincial furniture, French country furniture, lodge furniture, even contemporary furniture. 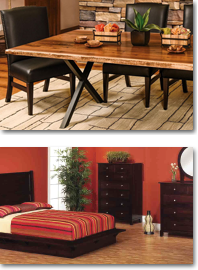 This includes an extensive array of dining room furniture, living room furniture and bedroom furniture; in fact you’ll find thousands of custom furniture items for all rooms including tables, chairs, beds, bar stools, benches, rocking chairs, desks, hutches, bedroom sets, 4 poster beds (four poster beds), armoires, entertainment centers, bedside tables, blanket chests, cedar chests, changing tables, chest of drawers, cradles, cribs, curio cabinets, gun cabinets, dressing tables, wardrobes, mirrors, rockers, hide a beds, bar chairs, bars, bookcases, TV stands, corner tables, end tables, library tables, loveseats, sofas, nesting tables, occasional tables, plasma stands, reclining chairs, rolltop desks, trestle tables, magazine racks, buffets, kitchen nooks, dining nooks, drop leaf tables, bureaus, bookcases, pie safes, dressers, coffee tables, dining room tables, pub tables, sideboards, computer desks, conference tables, credenzas, wood file cabinets, executive desks, drawing boards, coat trees, hat trees, foyer tables, entry tables, wash stands, dining room chairs, high chairs, jelly cupboards, leaf storage cabinets, benches, quilt cases, quilt racks, Morris chairs, children’s furniture, library tables, trestle tables, wine cabinets and wine racks. Amish handmade furniture can be crafted from many types of solid wood (including but certainly not limited to solid oak furniture). Oak furniture is most popular followed closely by cherry furniture. Of course many customers have specific requests such as Amish oak furniture, mission oak furniture, shaker oak furniture, oak country furniture, Amish cherry furniture, mission cherry furniture, shaker cherry furniture and cherry country furniture. Customers also often contact us for mission style furniture, amish furniture store, online amish furniture, amish furniture ohio, amish furniture stores, amish made furniture or wood furniture. Whether you’re an interior designer or shopping for your own home, we think you’ll find our website to be your best resource among online furniture stores. Although our hand crafted furniture includes virtually all styles, many of our customers specifically ask for Amish dining room furniture (Amish dining room tables and Amish dining room chairs may be purchased separately or in sets), Amish bedroom furniture, Amish living room furniture, mission dining room furniture (mission dining room tables and mission dining room chairs also may be purchased separately or in sets), mission bedroom furniture, mission living room furniture, shaker dining room furniture (remember - shaker dining room tables and shaker dining room chairs can be purchased separately or in sets), shaker bedroom furniture, shaker living room furniture, country dining room furniture (country dining room tables and country dining room chairs may also be purchased separately or in sets), country bedroom furniture and country living room furniture.